The above screenshot shows how the executive fare is lower than the economy class fare ! 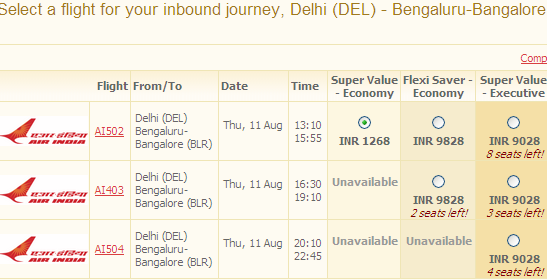 No one can beat the pricing algorithm of Air India. Once I have to go to Banglore form Kanpur and there is no direct flight. Either you go to Delhi or Lucknow and catch flight. for the same aircraft, the cost was higher for Delhi-Banglore than Lucknow-Delhi-Banglore. Note the aircraft was same. Flight takes off form Lucknow, stops in Delhi and then reaches Delhi. Cost ws less for extra distance!! Lucknow is 100km from Kanpur. Delhi ~500km form Kanpur. airline ticket pricing has always been a mystery to me. Air Canada and Lufthansa have code-sharing on flight from Mumbai to Edmonton. A ticket for this route on identical flights, when booked through Air Canada, were cheaper by more than Rs. 3k than the fare shown by Lufthansa!! In all fairness, you are comparing flexible 'economy' fare with regular 'executive' fare. It is not clear what the price of flexibility is; perhaps it is as high as that? 2) AI 421 from Delhi to Mumbai and AI 101 to New York via Delhi! Here`s my experience: I am planning to fly from Srinagar(Kashmir) to Hong Kong in a week`s time. The Air India flight from Srinagar to Delhi to HK cost Rs. 13.5 k with a flight change in Delhi. 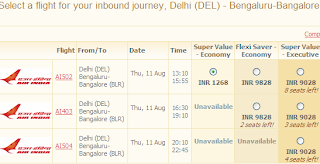 On the other hand when I checked to see the flight costs from Delhi to HK, it turned out to be rs. 14.5k. Effectively they are "paying me 1k" to fly to Delhi with them-Weird!